The targeted killing of those suspected of engaging in terrorist activities against the United States, including American citizens, is justified and legal, according to the Defense Department's chief lawyer. Pentagon general counsel Jeh Johnson is the first government lawyer to officially weigh in on the legal justification for killing a U.S. citizen since American born Yemeni cleric Anwar al-Awlaki was killed by a CIA missile fired from an unmanned aerial vehicle last September. In comments Wednesday night during a speech at Yale University, Johnson made no mention by name of al-Awlaki or the classified CIA drone program. "Belligerents who also happen to be U.S. citizens do not enjoy immunity where non-citizen belligerents are valid military objectives," Johnson said. He cited a 2004 Supreme Court decision as the justification for his comment. "Hamdi v. Rumsfeld, stated that "[a} citizen, no less than an alien, can be 'part of or supporting forces hostile to the United States or coalition partners' and 'engaged in an armed conflict against the United States.'" Johnson's remarks mostly mirrored what State Department counsel Harold Koh said in a speech two years ago to the American Society of International Law. "In an armed conflict, lethal force against known, individual members of the enemy is a long-standing and long-legal practice," Johnson said. What has changed is the technology used to attack suspected terrorists. Whereas Koh specifically referred to lethal attacks by unmanned aerial vehicles as a legal method of targeting terrorists, Johnson sidestepped any direct mention of the use of armed drones. Instead, he referred to advanced technology where "we are able to target military objectives with much more precision, to the point where we can identify, target and strike a single military objective from great distances." Johnson reiterated Koh's assessment that targeted killing is not assassination. "Under well-settled legal principles, lethal force against a valid military objective, in an armed conflict, is consistent with the law of war and does not, by definition, constitute an "assassination," said Johnson. Until recently, no one in the Obama administration would talk publicly about the CIA's secret drone program. President Barack Obama broke the silence last month when he defended the program during a question and answer session on the Internet. Al-Awlaki is not the only American who has been killed by a drone strike since the United States began its offensive against al Qaeda following the 9/11 terrorism attacks in 2001. Ahmed Hijazi, a Lackawanna, New York native, died in 2002 when a hellfire missile destroyed a car he was traveling in with five other people in Yemen. The intended target was Abu Ali Harithi, an associate of Osama bin Laden, who allegedly was involved in the attack on the USS Cole, which killed 17 U.S. sailors. At the time, U.S. officials referred to Hijazi as collateral damage. American Samir Khan was with al-Awlaki when the CIA destroyed their vehicle in Yemen. Khan was the editor of the al Qaeda English language magazine, "Inspire." 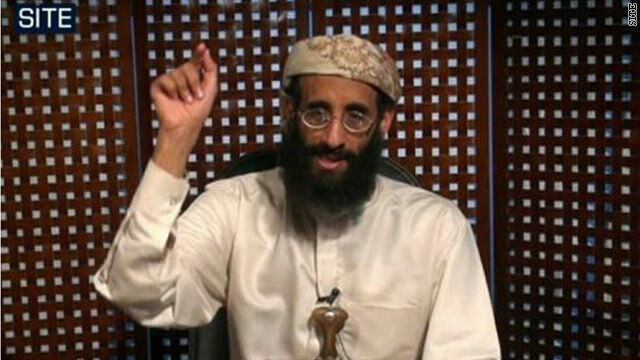 Al-Awlaki's son was among nine people killed by a drone attack in Yemen two weeks after his father died. U.S .officials said the teenager was not the intended target, and was in the wrong place at the wrong time. Human Rights First was not satisfied with Johnson's defense of targeted killing. In a written statement, Raha Wala, the group's advocacy counsel, said, "The American people deserve to know who the government believes it can kill in our names. General Counsel Johnson's speech did little to help shed light on the government's approach to targeted killing. It is this unexplained secrecy that has caused so many to question this program." A number of lawmakers and civil liberties groups have called on the administration to release more information about the legal justification for targeting Americans. Sen. Dianne Feinstein, D-California, believes al-Awlaki was "a lawful target" but called on the administration to provide details about its legal rationale in order "to maintain public support of secret operations." U.S. Attorney General Eric Holder is scheduled to give a speech on March 5 in Chicago where he is expected to discuss the issue of trageting Americans. Johnson also said the legal authority for the military's counterterrorism efforts was the Authorization for the Use of Military Force (AUMF) bill passed by Congress one week after the 9/11 attacks. But he added, AUMF was not open-ended. "It does not authorize military force against anyone the executive labels a 'terrorist'", Johnson said. "Rather, it encompasses only those groups or people with a link to the terrorist attacks on 9/11 or associated forces." He went on to define an associated force as a group that is aligned with al Qaeda and has "entered the fight against the United States or its coalition partners." Human Rights First welcomed Johnson's comments that the war is not open-ended, but said the administration needed to make the end point clearer. Raha Wala said, "suggesting the war extends outside Afghanistan to vaguely define associated forces is much too amorphous. "With the end of the war in Iraq, the death of bin Laden and the decimation of al Qaeda, the end of combat operations in in Afghanistan should mark the clear end of war." Wala said it is time for law enforcement and intelligence officers to take over response to the terrorism threat. Lower leg Exercises To Jump Better- Stand on the bottom straight up. actual league as well as his marketing possible. The Hyper – Fuse shoe is constructed of composite material that is light and strong. Hey. Al qaeda is at war with us. We are at war with them. That makes anyone who publicly identifies themselves as Al qaeda a fair target. And particularly someone who is clearly a principle operative of that organization. You don't stop on a battlefield to debate whether the guy wearing the enemy uniform and shooting at you is a threat. Common sense tells you that he is. Is it "assassination" to return fire and kill that individual? No. It's war. There is no "due process" or "judicial review." The definition of war is that those civilized tools are no longer the first course of action, because the situation has escalated beyond the reach of such measures. Is there anyone left at this point who thinks Al qaeda is not at war and does not take every opportunity they can to harm the US? Does this imperial pronouncement really surprise you? This is just a logical continuation down that very slippery slope to the cesspool of total tyranny. When the shoe is on the other foot, no one will feel sorry for the butchers currently murdering under color of office, hollow black robe law, uniform, or anything else. The show will be on the other foot some day. If that is the case he needs to investigate 9/11 fairy tale , because the world is writing books how it is impossible to bring buildings down as has been presented and the official story makes us look stupid. It takes a lot of imagination to even believe 9/11 story. Americans were killed. He needs to start with Gulliani, then Bush, Cheney- the whole 9/11 looks suspicious . This guy reminds me of Harold Ramis from his SCTV days. who is the obama gang defending this action before ? this is NO authority in the usa or other wise that is challengeing this. THIS IS SIMPLY OBAMA REMINDING US OF WHAT HE DID ! the fact is obamas foreign policy is the weakest usa policy i have ever seen in my life. syria , iranian nukes , 19 detained americans in egypt , pakistan recieves millions upon millions of usa tax payer coin. Didn't you read the article slush for brains? There are several groups and individuals who question the policy. This president has handled international affairs and conflicts pretty well. How simple is it to revoke someone's citizenship if they are engaged in warfare against the US, I wonder? Regardless, the man was a terrorist and whether you call it a precision military strike or an assassination, he got what he deserved. I'm completely anti-terrorist, but I wonder why we couldn't charge this guy with war crimes, and bring him back for a trial in America? If he's guilty of something, and it looks like he was, it should be easily provable in a court of law. American citizens, even living abroad, should not be killed without trial. Just my two constitutional cents. Have the drones saved lives in the end? I don't like them. But I started wondering. When you declare war on someone, all bets are off and there is no such thing as a fair fight.There seems only to be public opion. No one wants to see people not get a trial.Do your soldiers get a trial before thier lives are taken in battle? So, I guess what would make people happy are drone abducting vechiles. Just go in , zap em, take them into custody and go to trial. Stop making enemies, then maybe you can start to solve these problems for the long term. The U.S. had become a terrorist state. israel is the greatest threat to world peace. I was thhhhiiiisssss close to dnseing out the bloodhounds to find you Wordsmith... Glad to know the NYTimes Wahabbi lobby hasn't gotten to you.The graphic is great. We have to find a newspaper headline generator somewhere. I had a visit from moonbat Jen today who claimed that all this info had already been put out in the public domain.Yet, Keller claims that it was important to put this out for "public interest." Of course the real motive was to repackage this as another front page headline slam against Bush.This time it is backfiring.You know what would really be in the "public interest?" Find out who leaked this and PUBLISH THAT! Don't you think some enterprising newspaper reporters should be working on THAT story? "The guy shouldn't have been considered to be an US citizen." Why, exactly? If the government can just start revoking citizenship status on a whim, what's to protect legitimate citizens from receiving this same sort of treatment if they're simply ACCUSED of a crime? I don't like terrorism, but what exactly is wrong with giving this guy a trial? If he's actually a terrorist, it'd probably be pretty damn easy to prove. Why do we no longer respect our constitution? American citizens have a right to due process, as outlined in our constitution. Voice Of Reason is just another helpless Koolaid drinker. He actually believes what the news tells him. WHAT A CRAP STORY , who is the one THAT THE USA GOV IS DEFENDING THEIR ACTIONS AGAINST ??? FOLKS THERE IS NO AUTHORITY QUESTIONING ANYTHING , this is just another way the obama gang can claim that have been on the job of getting bad guys. ok , good you got the bag guy, WHAT ABOUT IRANIAN NUKES ???? Let's bomb israel – the dirty evil zionists are the real terrorists in the world. Everybody hates israel. why is miplititic so wanting to attack the Iranians? Because she is a zionist dog. Real American Patriots don't give one flip for the baby killing zionists or for the nutty Iranians. Obama admin has not done anything to capture the bad guys. The ones that deserve credit are all the ones in the DOD, Troops, and all the personnel that are directly working to stop these guys. Obama admin has no idea who is killed and why until after the fact. It really annoys me to see them take credit when they have done nothing but sleep in their warm beds in their own houses and eat good meals 3 or more times a day while the troops and personnel working on stopping them live in terrible conditions, get crap food, and work long hours with 15 days of vacation in a year. Its bull crap, is admin and him have been and will always been useless. a terrorist is a terrorist is a terrorist and can be targeted anywhere in the world, there are no safe havens. i have no problems with our approach to the removal of these cancers wherever they may be found. anyone riding in a car or sharing a house or hookah or for that matter hiding in a mosque with a terrorist needs to realize that they are at risk. Dude, Rick is not a racist. Terrorists have no race. Terrorism is not a race, but a cancer upon the earth. Idiot they don't know that they're in any of those places with a terrorist. Terrorists don't announce who they are you bag of turds. Or driving a van in Oklahoma City. What a foolish and dangerous policy. What we all forget is that we used to be a nation of laws and that's why were were admired and respected by the world. Then we adopted bizarre, psychotic policies like illegal wars and pre-emptive actions like that of paranoid and warmongering states like our good friends the Zionazis and we started our own national death spiral. And like them, now we have no Constitution to guide us because we prefer to give up the legal protection of others for our personal convenience. And we ignore everything the Founding Fathers told us and blindly trust our corrupted politicians who have all been bought and sold with our own tax dollars. So you want to hand over your civil liberties and allow your nation to fight illegal and unjust wars as you cheer the TV with a beer in your hand? What's good for the goose is good for the gander...What comes around goes around....Karma and Kismet baby.